April saw many wet nights on Fraser, which seemed to reduce the number of mammals spotted around Kingfisher. Most noticeable were the low numbers of Sugar and Squirrel Gliders and an absence of rodents and Bandicoots. We didn't see any particular species more than usual, but a few less common creatures made some cameo appearances on Fraser's western side. High in the gum trees surrounding the resort, Grey-headed Flying Foxes could be seen and heard just about every night - cackling and bickering amongst themselves. Large numbers of Little Red Flying Foxes and Micro Bats were spotted on several nights - flying at high-speeds and hunting insects. A Carpet Python made its home next to the Resort's pool shed - well out of the way of resort guests and traffic - for a few days. It could be seen curled up right out on the open ground, attempting to digest a fairly large creature - perhaps a bat or a Bandicoot. In the Wallum area - frogs and even Cane Toads were not as prominent as they have been in other months - although Striped Rocket Frogs were glimpsed occasionally. A smaller Long-finned Eel was also seen a few times on the resort's regular night walk. The highlight for the Wallum area for the Rangers and greenies was a Barn Owl, which was spotted on just one occasion in a tree above the Dingo Den. It sat staring at the light for some time, before flying off toward the hotel rooms. A great start to bird watching for Bird Week! 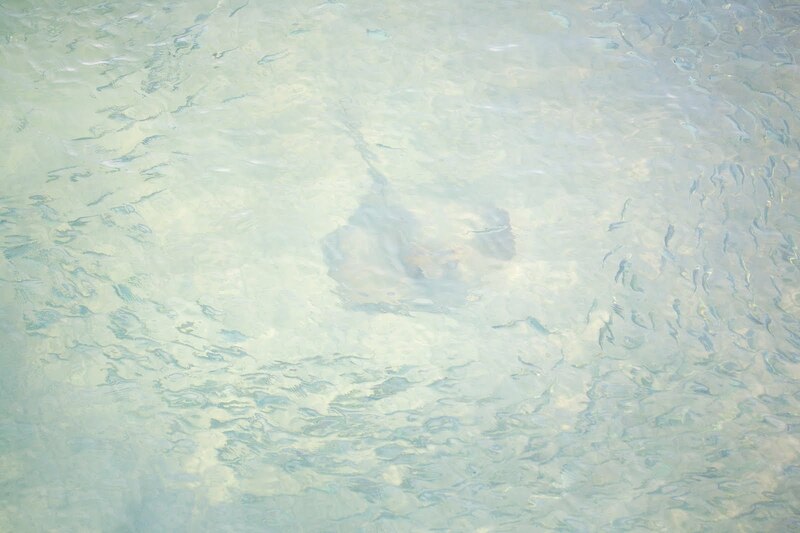 From the jetty, the usual Common Estuarine Stingrays (see pic) were spotted digging for crabs and eating bait fish. Eagle Rays were seen occasionally swimming much closer to the surface than their relatives. Some nights there were swarms of Garfish and there was no shortage of Arrow Squid in the calm waters of the Great Sandy Straits. A very large Mud Crab was seen walking along the sandy bottom and little Paddler Crabs made a few appearances swimming by at the end of the jetty - easily spotted as their back legs are modified as paddles and beat vigorously to keep the animal moving in the water. Another wet month seems to have dissuaded some of the wildlife from being too active, but again a few of our interesting and less common friends did pop up and say hello - must to the delight of guests and staff alike. Now into May.. we turn our attention to our feathered friends and the start of Bird Week for 2010. We'll keep you posted with the action as it comes to hand. Until next time, Ranger Ash. Blog excerpt taken from Blue-dogphotography.blogspot.com - Images and words by Danielle Lancaster, Blue Dog Photography. This morning I finally photographed a male Mistletoe Bird, Dicaeum Hirundinaceum. 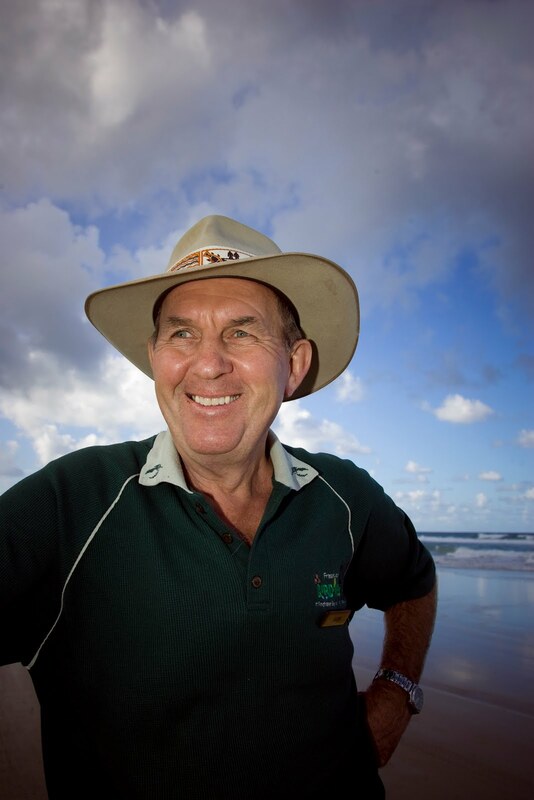 Now while not uncommon in certain areas, such as within the grounds of Fraser Island's Kingfisher Bay Resort, what makes them a difficult subject is that they are so busy. These tiny birds, only 10-11cm, have a brilliant scarlet throat and under-tail that catches, not only the sun but also the eye of any avid bird watcher. Well, the boys do. Mistletoe Birds are known to show marked "sexual dimorphism". What this means is that the males get to be flamboyant in their colourings while the females are far less glam. Early morning insects have them snapping their beaks as they dart swallow-like in flight, fluttering and calling to their mmates in the bush surrounding the resort. They have sharp little voices but a choice of calls including a high double note and a warble. We had joined Ivor Davies, Group General Manager of Kingfisher Bay Resort (see above) for a bit of bird spotting. Ivor is a keen twitcher and knows his 'bird stuff'. Indeed, he's just returned from a trip to the Red Centre where he added a futher 10 birds to his personal spotters' list. He not only tells, but also acts out the performance of the Mistletoe Bird, a canopy bird, passing the digested mistletoe and how it ever so gently wipes itself along the branch three times - only three -bobbing between each wipe. It's a rather elegant performance from a six foot three man. The wealth of information on birds acquired not only on Fraser Island but across the world over years, flows eagerly. Visit www.kingfisherbay.com.au/fraser-island-birdweek.html for the full wrap up.